Two More For The Road Jazz swing duo playing ballads and Jazz standards. Performing easy listening live music tailored specifically to suit every audience. Two More For The Road will create the perfect atmosphere for your special event whether playing background music or by taking centre stage. 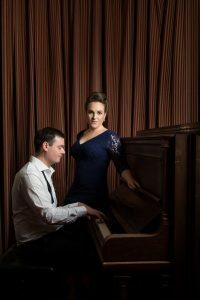 The Duo performs jazz standards made famous by Ella Fitzgerald, Frank Sinatra, Nat King Cole, Sarah Vaughan, Louis Armstrong, Cole Porter, George Gershwin and Nina Simone as well as Norah Jones, Diana Krall, Eva Cassidy, Michael Bublé and Jamie Cullum. You can hear us by clicking on to our demos. There are also jazz covers of pop songs such as George Ezra’s ‘Budapest’. Miriam trained at London’s Royal College of Music and Guildhall School of Music & Drama. as a performer, she has worked alongside Prince and Amy Winehouse. 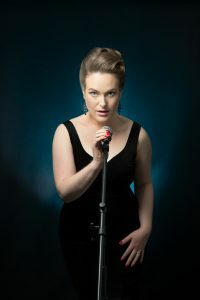 Miriam has also sung for live TV broadcasts for the BBC and ITV. Andy graduated from Glasgow University with a BMus (Hons) degree and has a Diploma in Pianoforte performance from the Associated Board of the Royal School of Music. He plays piano, guitar, bass guitar and saxophone. The duo is available for drinks receptions, launches, corporate events, private parties, balls, dinner parties, cocktail parties and weddings. Please don’t hesitate to contact us through Neil Drover Agency.